This weekend found Caroline and myself in Edinburgh attending a course in Medical Acupuncture. 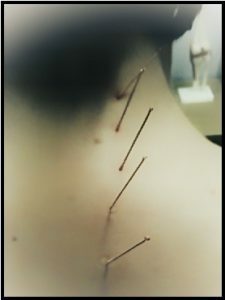 I’ve been using acupuncture for a number of years, but my original training was a mixture of Traditional Chinese philosophy and western methods, so I was keen to refine my techniques and update myself on current thinking and practise; for Caroline this will enable her to integrate acupuncture techniques into her current practise. So what is it, and what’s involved? Acupuncture – the insertion of (very thin) needles into the tissues for therapeutic purposes – in our case to relieve pain. Does it hurt? I’d be fibbing if I said it was without discomfort, but I wouldn’t describe it as painful. I was “needled” in many places this weekend, and in most cases, I didn’t even feel the needle go in. Occasionally, there was a slight “scratch” sensation. The practitioner is looking for a “twitch” from the muscle; once this is obtained, the needles can come out. It often takes less than five minutes do achieve what’s necessary. What does it do? Three things, essentially. It increases local blood flow, it blocks some pain pathways, and it stimulates the release of endorphins, which are the body’s own pain controllers. Useful as part of the treatment process. As a result, local muscle spasm/tightness is also relieved. How long does it last? Apparently, MRI scans have shown effects up to three days following treatment. What is it used for? In our case, it’ll be used to help with pain relating to muscle, bone and joint problems, as part of overall treatment. We wouldn’t use it for illness or internal problems of any kind. All the various skills we learn add to our repertoire of approaches – they give us another tool we can use to provide help for our patients. If you’d like to now more or ask us any questions, please get in touch – I think it’s safe to say that this is an additional approach we’ll be discussing with patients from time to time and using where appropriate.